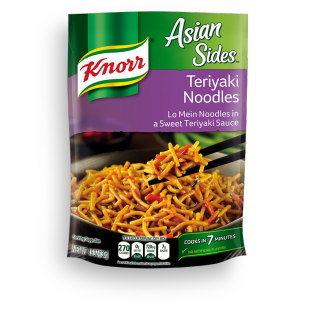 Asian noodles and mixed vegetables are packed with the sweet flavor of teriyaki sauce in our Teriyaki Noodle Asian Sides. It's just what you need to create tasty dishes like our Asian Shrimp & Peanut Stir-Fry. Teriyaki Noodles is rated 4.8 out of 5 by 13. Rated 4 out of 5 by nan61 from Great main dish I use the teriyaki noodle dish as a main dish, I add 2 tablespoons of Moore's teriyaki sauce to some top sirloin that I have cubed up, cook it and then cook noodles according to recipe, and mix together, and add a side salad, It is just enough for two adults. Rated 5 out of 5 by Grego from Why go out when you can make this at home Tell you what, Buy some boneless chicken thighs, cube them up and brown them in a pan. Then add them to these noodles and you have a real treat. Great product. Rated 5 out of 5 by Jannn from Amazing! I am a very picky eater and this is the only kind of Asian food I will eat. There's just something about how simple it is that makes it so great! Rated 4 out of 5 by eli935 from Asian sides are great A great Asian side dish, I love the flavor and ease of preparing. thanks!